Pontiac G3 Wave cabin air filter location. Where is located air conditioning filter on a Pontiac G3 Wave. From year 2009. Here you can find how to locate Pontiac G3 Wave cabin filter when you need to replace. Air conditioner filter on Pontiac G3 Wave is located inside of car behind the glove box. To replace cabin air filter on Pontiac G3 Wave you need to follow the next steps. First time you need to open glove compartment and remove the stops by pushing in on both side of the glovebox and remove the glove compartment. 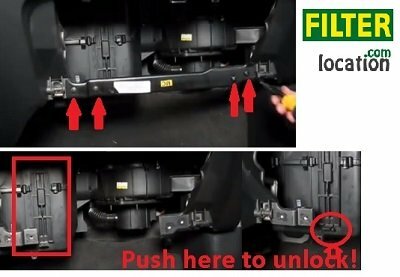 Remove the screw that secure the metal bar to the vehicle and remove it (see in picture). Here you can see cabin air filter housing cover. To change filter open the housing cover by pushing on the panel of cover panel. 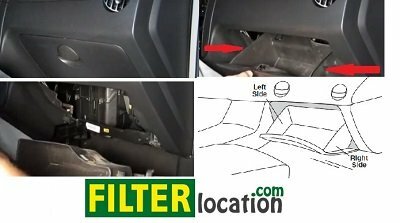 Remove the old filter by pushing straight and install the new filter with the air flow indicator arrow pointing to the right an reinstall the panel how secure cabin air filter. Reinstall the metal bar and the glove compartment. Why you need to change the Pontiac G3 Wave cabin air filter? Is necessary to do this to protect your health and you passenger health. To this to remove odors, pollen allergy and other pathogens and pollutants. Is indicated to change the Pontiac G3 Wave pollen filter each 12-15000 miles. For more guidance feel free to ask about how to replace the air conditioning filter for Pontiac G3 WAVE. If you want to reset service light reminder on Pontiac G3 Wave click here. 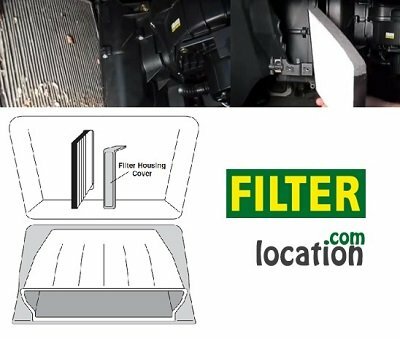 How to locate if you need to change cabin air filter, oil filter, fuel filter, pollen filter or air filter on Pontiac G3 Wave.